Back in 2003 when Konica bought Minolta, the merged company was expected to go toe-to-toe with Eastman Kodak and Fujifilm after a century of innovations in Japan that included the nation’s first brand-name camera (1903), and color film (1940). Instead, the combined company surprised the industry in 2006 by withdrawing from photography altogether. More than a decade later, Konica Minolta aims to turn heads again. A corporate giant focused on digital, optical and electronic technology, Konica Minolta last year bought Ambry Genetics for up to $1 billion ($800 million upfront, the rest in milestones), in a deal completed October 20, 2017. Six days later, Konica Minolta completed its purchase of Invicro, a contract researcher organization (CRO) that provides imaging services and software for biopharmas for research and clinical development. The deals gave Konica Minolta a beachhead in precision medicine, a market projected to more-than-triple by 2026 to $141.70 billion up from $43.59 billion two years ago, according to BIS Research. “Philips is the closest competitor that is focused on a digital pathology and precision medicine theme alongside of its imaging device business. They chose the road of pathology as opposed to genomics, where Konica Minolta will take a lead,” said Divyaa Ravishankar, industry principal, Transformational Health & Life Sciences with market research firm Frost & Sullivan. 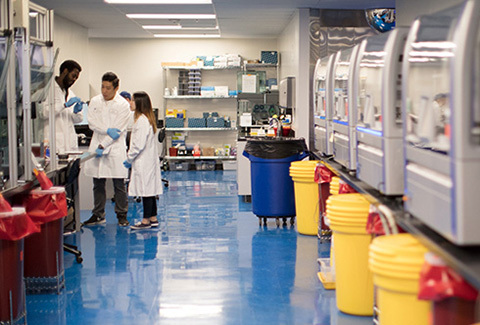 Earlier this year, Konica Minolta established a global headquarters in the U.S. for its new Konica Minolta Precision Medicine division to be based in Alisa Viejo, CA at Ambry Genetics. And in July, the company named John E. Niederhuber, M.D., to chair its Scientific Advisory Board, a former director of the NIH’s National Cancer Institute, and current EVP and CEO of Inova Translational Medicine Institute, and recently named President and CEO of the Genomics and Bioinformatics Research Institute, a joint venture between Inova Health System and the University of Virginia. Expanding in precision medicine, Konica Minolta says, will entail both organic growth and acquisitions focused first on greater engagement with biopharmas. The company already works with most pharma giants through its CRO Invicro, but expects to generate more biopharma business for Ambry, reviving an area from which the company retreated several years ago to focus on clinical testing. Kenneth Bloom M.D., chief medical officer of Advanced Pathology and Genomic Services for Konica Minolta, said the company aims to meet the genomic need of biopharmas by showing them that its technologies can help de-risk their drug development, by identifying the right targets for new therapies through the company’s variety of technologies.